I recently bought Tanya Burr's new book Love Tanya and although I love the whole book, my favourite section has to be the baking section! 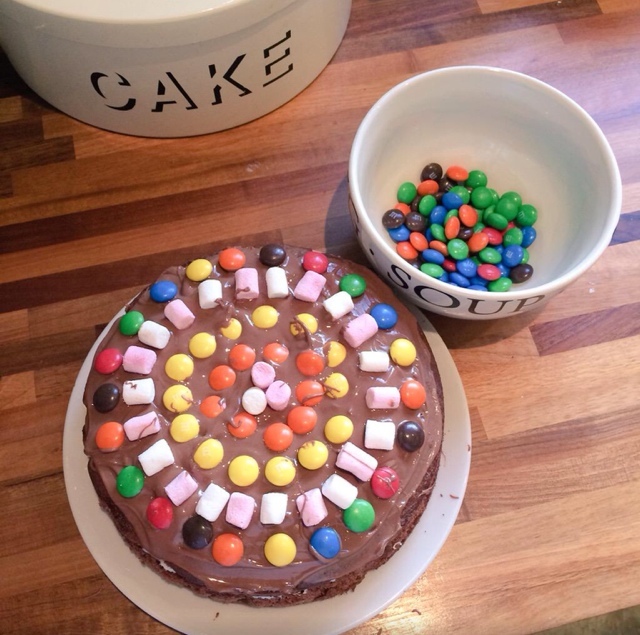 I thought I'd try out the 'Sunday Cake' recipe and it turned out so well that I thought I'd share it on here!! For the icing, whisk the butter, icing sugar and cocoa powder together and for the topping, melt the chocolate in a bowl over a pan of simmering water. When the cake is cool, sandwich the two sides together with the icing and pour melted chocolate over the top of the cake. Decorate with your chosen decorations - I used marshmallows and M&M's but you can use whatever sweets/ chocolate you have in your house! And there you go, I hope you try out this recipe and look out for plenty more recipes to come on this blog! Is there anyone who wasn't really happy with this recipe? I was really excited to try it, but when I did I was more sad than happy. Firstly I wasn't sure if the dough is baked enough or not, it wasn't sticky but it was chewy. Could it be too much sugar? It is really sweet. Then I tried the cream and it wasn't working at all, I had to do it according to different recipe and finally I couldn't get the chocolate on sides. I think I'm not so bad in the kitchen and I'm not saying it is the bad recipe, but I think something went wrong and I don't know what was it. I'm finding this problem with many of the recipes - I'm quite a seasoned baker but I've tried 5 of her recipes now and none of them have really been that impressive ... Either the taste or the texture is off or they just taste underwhelming - quite disappointing because I love Tanya! !